On Trade, Trump Administration Likes to Leave Other Countries Guessing On issues such as the Trans-Pacific Partnership and steel and aluminum tariffs, flip-flops and mixed messaging make it hard to discern a coherent U.S. trade policy. President Trump delivers remarks before signing tariff proclamations on steel and aluminum imports at the White House on March 8. 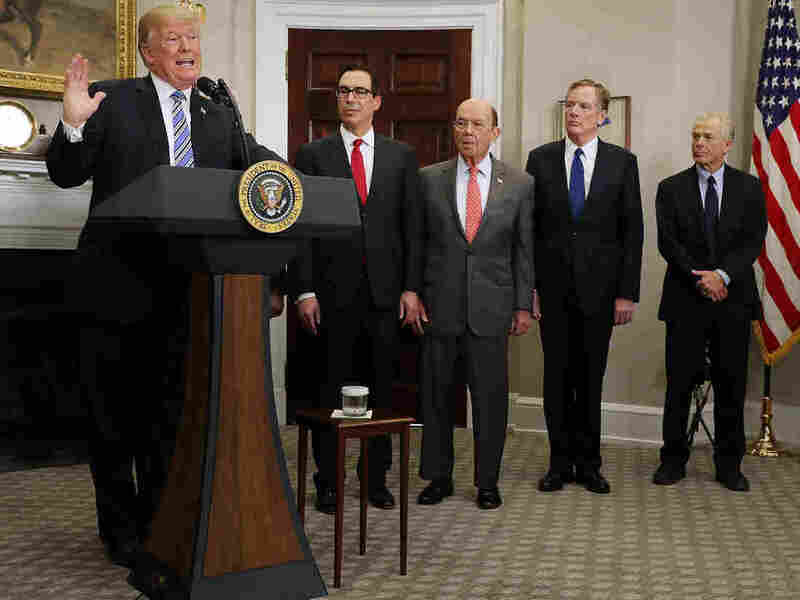 Treasury Secretary Steven Mnuchin (second from left), Commerce Secretary Wilbur Ross, U.S. Trade Representative Robert Lighthizer and White House National Trade Council Director Peter Navarro look on. Days later, however, Peter Navarro, White House trade policy adviser, contradicted Mnuchin in an interview with NPR's Morning Edition. Mnuchin's remarks were an "unfortunate soundbite," Navarro said. On matters of trade, the Trump administration has sometimes demonstrated a kind of split personality, making strong pronouncements one day only to tone them down or even reverse course later. In early March, for example, President Trump announced sweeping tariffs on imports of steel and aluminum imports. He soon suggested he might exempt certain countries from them. Amid the ensuing uproar among businesses and U.S. trading partners, Trump spent the next few weeks deciding which countries to spare. A deadline was set for the tariffs to take effect but was extended until Thursday, when Trump finally announced he would no longer exempt Canada, Mexico and the European Union from steel and aluminum tariffs. Similar mixed signals were sent over the Trans-Pacific Partnership, a multilateral trade pact that was a centerpiece of the Obama administration's efforts to contain Chinese influence. During his campaign, Trump regularly criticized the pact as harmful to U.S. interests and vowed to withdraw from it, a promise he kept shortly after taking office. But earlier this year he said he mused about rejoining the agreement. Murkiness has also characterized the ongoing effort to renegotiate the North American Free Trade Agreement, making it difficult to tell how much progress has been made. "We're working very hard on NAFTA with Mexico and Canada. We'll have something, I think, fairly soon," Trump said on April 6, as another round of talks got under way. But by late last month it was clear the three countries remain far apart and a resolution is unlikely before next year. Trying to discern a coherent strategy in moves like these is "mentally debilitating," says Dan Ikenson, director of trade policy studies at the Cato Institute. "My view is we need to distill the signal from the noise. The problem is, if there's a signal there, it's pretty weak," Ikenson says. The lack of a clear direction is partly due to the sharply differing views about trade among the president's core economic advisers. Mnuchin and Larry Kudlow, director of the National Economic Council, hold the kind of orthodox pro-trade views that have long defined the Republican Party. Commerce Secretary Wilbur Ross, U.S. Trade Representative Robert Lighthizer and especially Navarro are much more hawkish, blaming the persistent U.S. trade deficit on unfair practices by U.S. trading partners such as China and the European Union. But the erratic trade policies may also be an outgrowth of Trump's particular negotiating style. The president has frequently suggested he sees sowing confusion as an essential part of keeping adversaries on guard. "The strategy, if one can call it such, seems to be that threats, bullying and some degree of unpredictability can gain the U.S. an upper hand in trade negotiations," says Eswar Prasad, a senior professor of trade policies at Cornell University and senior fellow at the Brookings Institution. Such an approach may secure the U.S. short-term gains with its trading partners, who may choose to accommodate the president in order to avoid disrupting trade, Prasad says. But in the long run it erodes confidence in U.S. leadership and can even undermine global trade, he says. "For the U.S.'s trading partners, it's become very confusing trying to figure out exactly what it is the U.S. wants, who speaks for the U.S., and whether the U.S. will have a predictable and consistent position in trade negotiations. It's made life very complicated for those on the other side," Prasad says. After published reports said the administration was considering hefty tariffs on imported autos recently, Japan's trade minister, Hiroshige Seko, warned it "could lead to the breakdown of the multilateral trade system based on [World Trade Organization] rule." The administration has also muddied the waters by sometimes mixing trade concerns with foreign policy objectives. For example, the Commerce Department barred the Chinese telecom company ZTE from buying parts in the U.S., because it had violated sanctions against North Korea and Iran. But Trump suggested the punishment could be relaxed as part of an overall trade agreement with Beijing. Likewise, when the U.S. announced tariffs on steel and aluminum imports, it did so under a little-used law allowing countries to protect industries vital to national defense. "It doesn't seem that saying, 'Oh, we're going to go easy on ZTE because we've had some good discussions with China about some other things,' is really the best way to defend national security," says Celeste Drake, trade policy specialist at the AFL-CIO. Such confusion over goals also undermines people's faith in the notion that the global trading system is fair, Drake adds. "From our point of view, the sort of flip-flopping, the mixed messaging, isn't effective. It's not effective if what you want is for American citizens to trust that there's a coherent strategy and that it's good for them," she says.